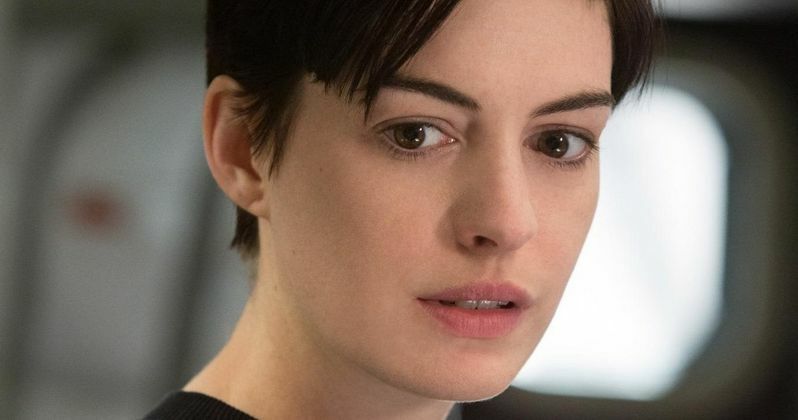 After making her producing debut with this year's Song One, Anne Hathaway has signed on to star in and produce the sci-fi comedy The Shower. The project isn't set up at a studio quite yet, with The Wrap reporting that producers first plan on finding a director and other stars before taking it out to studios. The Shower was written by Jac Schaeffer, which landed on The Blacklist as one of the industry's most well-regarded un-produced screenplays. The Shower starts at a baby shower, where guests witness a meteor shower. The male guests all start transforming into aliens, as the women are forced to fight for their own survival, and save the world as well. No details were given for the role that Anne Hathaway will take on, and it isn't known how many supporting roles need to be filled. Anne Hathaway will produce alongside her husband Adam Shulman, Andrew Lauren of Andrew Lauren Productions and D.J. Gugenheim. D.J. Gugenheim signed on as Andrew Lauren Productions' president of production back in April, to help the company put out at least three films per year. Before joining the company, D.J. Gugenheim was a development executive at Lotus Entertainment. Anne Hathaway will next be seen in The Intern, where she co-stars alongside Robert De Niro, arriving in theaters September 25. She also reprises her role as the White Queen from 2010's Alice in Wonderland in next year's sequel Alice Through the Looking Glass. The actress was also attached to the sci-fi adaptation Robopocalypse before that project was shelved indefinitely. Since the project doesn't have a director attached or a studio on board, it isn't known when this may come together. But, with an A-list star like Anne Hathaway attached, and a highly-touted Black List script, it could also come together very quickly. Are you excited to see what Anne Hathaway can do with The Shower?